During this time, I was preaching that God would perfect the bride using the five-fold ministry of Ephesians 4:11-16. Upon hearing this, many of those who claimed to be following the message that Brother William Branham brought began to tell me that the five-fold ministry of Ephesians, Chapter 4, was not for the bride and probably took place somewhere in the church ages. As much as I wanted to believe this, something within would not let me do it; now I see why I didn't. I became so troubled about the matter that I decided to fast and pray to God about it (this is the same fast I spoke about earlier). So I began a fast that lasted for forty days and nights. It was on the 38th day of prayer and fasting that an audible voice came into the room and said, "He (Brother Branham) was an Old Testament type prophet." That was the answer I was waiting for. Many times on taped messages I would hear Brother Branham say, "The Word doesn't come to anybody but a prophet." I would also hear the followers of his message say the same thing without searching the scriptures. The only thing about this is that it's wrong in the way that it is being applied by those that follow the message. When we are speaking strictly of Brother Branham, him having the spirit of Elijah (an Old Testament type spirit), it was giving identity to the scripture that he fulfilled in Malachi 4:5-6. When you check this with the New Testament, the five-fold ministry of Ephesians, Chapter 4, that kind of a statement is out of sync altogether with scripture. To the Jews there were 12 apostles, and there was Paul who was given to be the apostle to the Gentiles; all of them were here at the same time and none of them were prophets, but the Word came to them. The Book of Acts tells of three prophets who were all here at the same time. 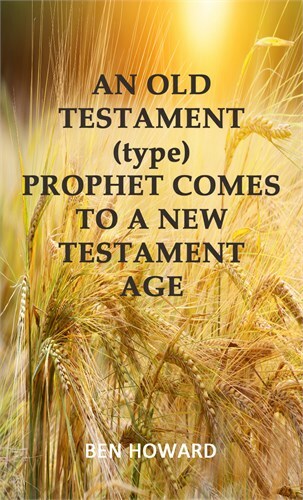 So when God gave me the revelation that He sent Brother Branham as an Old Testament type prophet to this New Testament Age, He was showing that He was sending the Word once again like He did in the Old Testament; for in the Old Testament God sent one man, and the Word came to him. I wrote this in a book entitled, An Old Testament Type Prophet Comes to a New Testament Age . When Brother Raymond Jackson read his copy, he said, "It was like something in me said, "It's time to preach it." He immediately sent me a letter praising God and asking for more copies to send to the Canada saints. That letter meant a great deal to me, and I have kept it on file to this day. Please listen to the audio below or read the book. There I was in hell...such a miserable place it was; such a feeling of depression and hopelessness; I can't begin to describe to you the depth of it.